Summary: I’m not a monarchist, but I definitely came down on the side of the Queen at the time, and again watching this film I couldn’t help but feel that the British public were wrong-headed and even cruel, driven on by the media. 1997, and Britain is ushering in a new era. After thousands of years of Thatcher, the country rallies behind the young radical leader Tony Blair (Sheen), inventor of something fresh and exciting called New Labour, promising all kinds of excitement. The Establishment is underwhelmed, primarily anxious that this new PM will expect to be called by his first name. Still, life in Buckingham Palace goes on much as usual; the Queen (Mirren), after all, has worked with prime ministers from Churchill to Major. And then… in September the world wakes up to the shocking news that Princess Diana, the divorced wife of Prince Charles (Jennings) and mother of the heir to the throne, has died in a car crash in Paris. The world, and the British public, reel. And then the sympathetic tributes pour in – flowers are stacked up outside the gates of Buckingham Palace, and tear-stained tourists sniffle on the 6 o’clock news. But Buckingham Palace is empty. The Royals are on their usual summer holiday in Balmoral, and the Queen sees no reason to change their plans. They will mourn in private; Diana, after all, is no longer a member of the family, this is not a matter of state, and the Queen’s instinct is to protect her grandchildren, who will soon be sorted out by a brisk walk and a bit of shooting. Charles is dispatched to Paris to bring home the body, which will be buried privately at the request of the Spencers. Well, anyone who was alive can remember what happened next. The British public went temporarily insane. Outpourings of grief for Diana; queues to sign hastily set up books of condolence; rotting floral tributes all over London. And Blair, aided and abetted by Alastair Campbell (Mark Bazeley), seizes the moment, describing Diana as ‘The People’s Princess’. The beleagured Queen, isolated in Scotland, is increasingly vilified in the press for her terribly British reaction – and it’s up to Blair to try and save the monarchy from itself. We all know that the Queen did survive – and in fact has come through with flying colours, more popular than ever, while Diana has, thankfully, been consigned to the scrapheap of history, commemorated only by a fairly rubbishy fountain in Hyde Park. But The Queen is about more than just this personal story; it’s about class, and attitudes, and the changing face of British society. At the centre of this is Mirren’s fantastic performance. It must be terribly difficult to play a living person, especially one as well-known as HRH, but Mirren pulls it off, as do all the cast – there’s an initial discomfort and then after ten minutes it all seems completely normal. 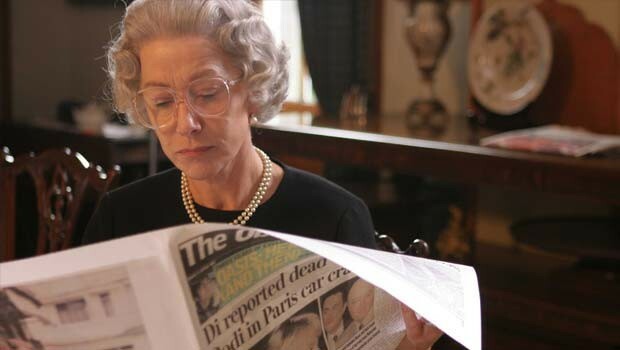 Bound always by protocol, Mirren’s Elizabeth is still surprisingly witty and sharp; on learning of Blair’s electoral success, she wishes she could be ‘partial’ sometimes. Michael Sheen, now an old hand at playing Blair, counterbalances her poise with a performance of shiny unctuousness. The differences between them are delicately marked by art direction and wardrobe; Blair chatting on a cordless handset, wearing a ghastly Newcastle strip with BLAIR on the back; Ma’am, bolt upright, perches on a chair, clutching a bakelite phone in an interesting shade of eau de Nile. I’m not a monarchist, but I definitely came down on the side of the Queen at the time, and again watching this film I couldn’t help but feel that the British public were wrong-headed and even cruel, driven on by the media. The royals did misjudge the public mood, but I found myself in sympathy with Prince Philip! (Cromwell) when he acidly comments on the irony of being called nutters by people who were busy tearing their hair out for a woman they’d never met.